Munchery is a meal delivery service that specializes in providing convenient prepared meals and meal kit options. They are passionate about helping busy people put healthy and tasty dinners on the table, with minimum time and hard work and little mess or waste. 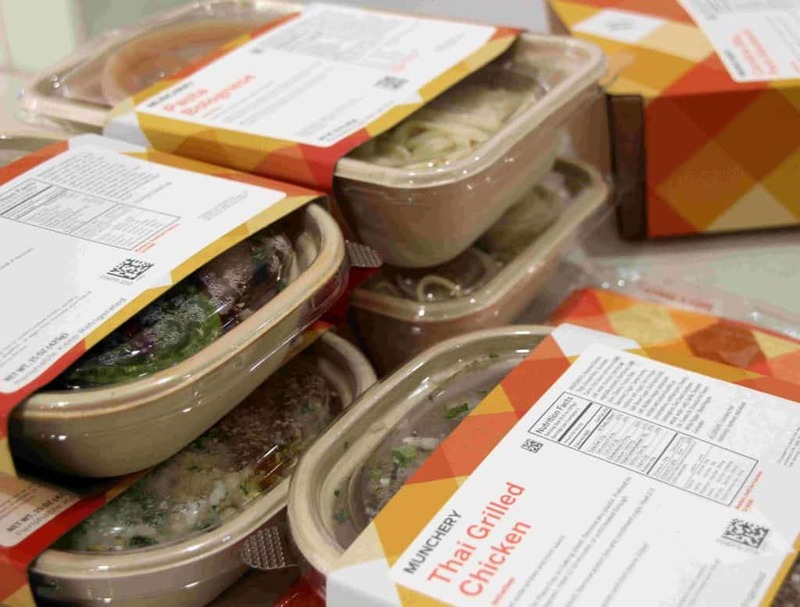 Munchery began operations in 2011 with the goal of providing a convenient and healthy alternative to fast food, frozen food, and restaurant take outs. Munchery provides an easy, online food delivery service that helps busy people put fast, healthy and delicious dinners on the table without any of the hard work, mess or waste. Munchery can deliver both prepared meals and meal kits that take no longer than 15 minutes to cook. Both the prepared meals and meal kits have been designed by their team of culinary experts in the kitchen. Everything is made from scratch, using fresh local ingredients. With Munchery, you are guaranteed to receive meals using only healthy, tasty and all-natural ingredients. Munchery was created out of the belief that the way we eat in today’s fast-paced modern world is constantly evolving and moving away from traditional home cooked, sit-down dinners. Despite this, people still want to eat well, but life often gets in the way! Munchery is most appealing to people who are too busy to cook, who are uninspired in the kitchen, or who would rather be anywhere but the kitchen! Munchery seem to understand that food is a personal choice. Therefore, the weekly menus are designed to accommodate a large variety of tastes. In the ‘prepared meals’ section you will find an assortment of 10 meals per week, that change on a weekly basis. All meals are made with fresh ingredients, sourced from local producers who value quality and sustainability. In the ‘cooking kits’ section you will find a selection of six meals per week, that are changed on a weekly basis. With their meal kits, Munchery plays the role of sous chef ensuring that all the chopping and portioning of local and sustainably-sourced ingredients is already done for you. This means that cooking a delicious dinner for two is a simple, 15-minute affair. What do Munchery meals really taste like? 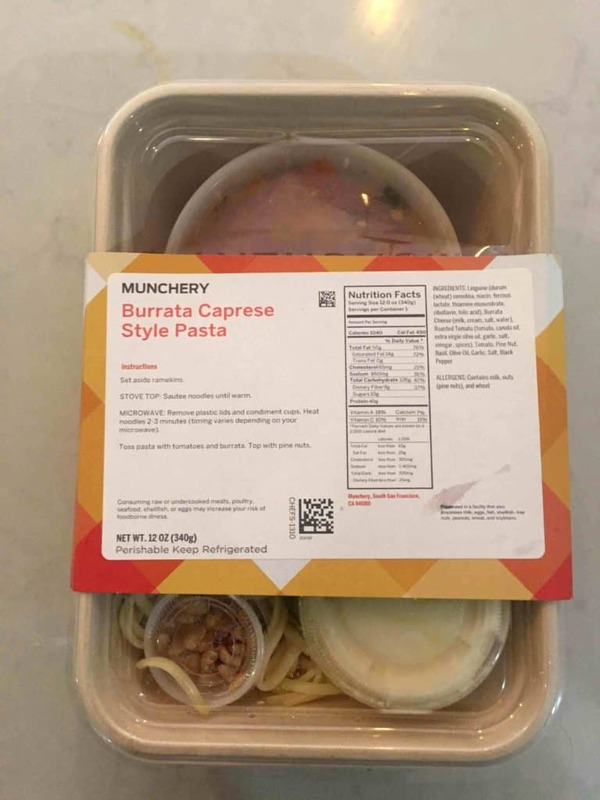 Our meal kit review team ensures that they taste a wide selection of meals from every company that we review, including items from the Munchery menu. 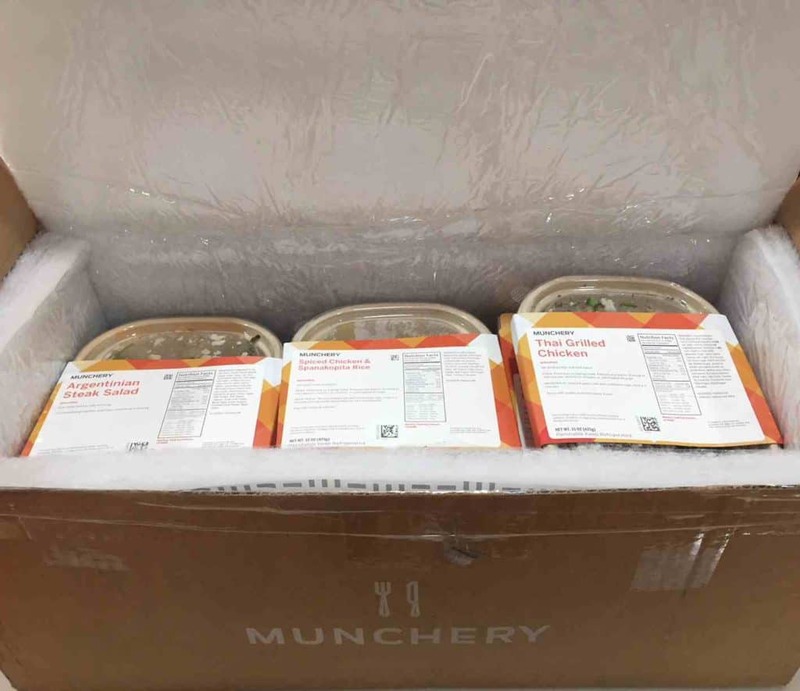 We have to say that we were super pleased with everything that we received from Munchery. To put it simply, the meals are delicious! 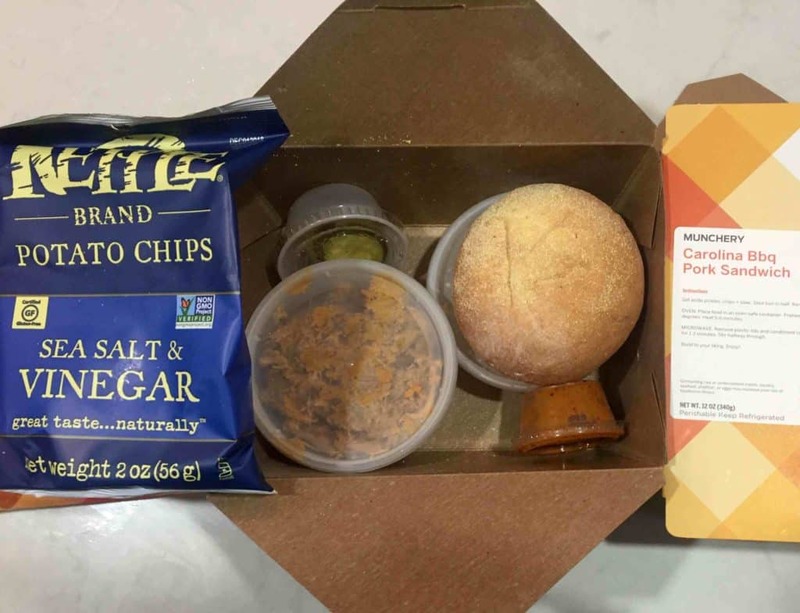 We tried both their prepared and their meal kit service. Both options were very easy to heat or cook, they tasted like genuine homemade meals and the portion sizes were excellent as well! All the meals are properly cooled immediately after the cooking process is complete. By doing so, Munchery maximize food freshness, and keeps the added fats and sugars to a minimum which is preferable to a traditional take-out. With Munchery you enjoy great food that is both healthy and delicious. 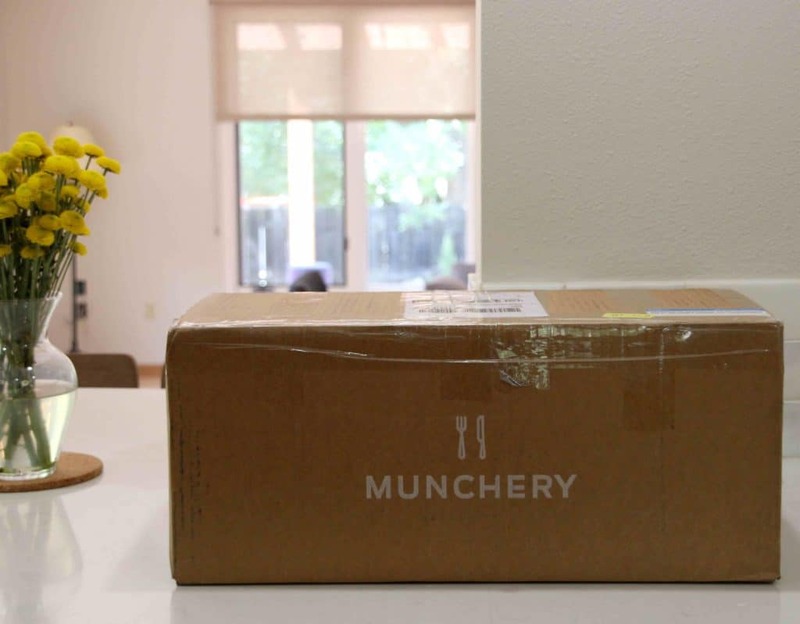 Where can I get a Munchery box? For now, Munchery operates on the West Coast only! You can get a same-day delivery in the San Francisco Bay Area and Los Angeles. A weekly based delivery is available in the Greater West Coast region, including Utah, Arizona, Colorado, Nevada and more. Munchery may offer different products and plans depending on the location, so best to check their availability here. The Munchery box is well organised and aesthetically pleasing and is made with recyclable insulating material. Included with your delivery are large non-toxic, water-soluble frozen gel packs to ensure that your ingredients are kept fresh and chilled until your delivery is received. The boxes we received were left outside for a few hours, and all the meals inside were still nice and cool when we opened it. Each meal is wrapped individually in its own branded sleeve, with the meal name, preparation instructions, ingredients list and all the nutritional facts of the meal included on it. This type of organization is incredibly convenient and informative! Munchery is committed to preparing every meal using only fresh and natural ingredients. To do so, Munchery have partnered with local farmers who specialize in seasonal, all-natural, and organic produce, offering antibiotic-free meats, and using wild-caught fish whenever possible. 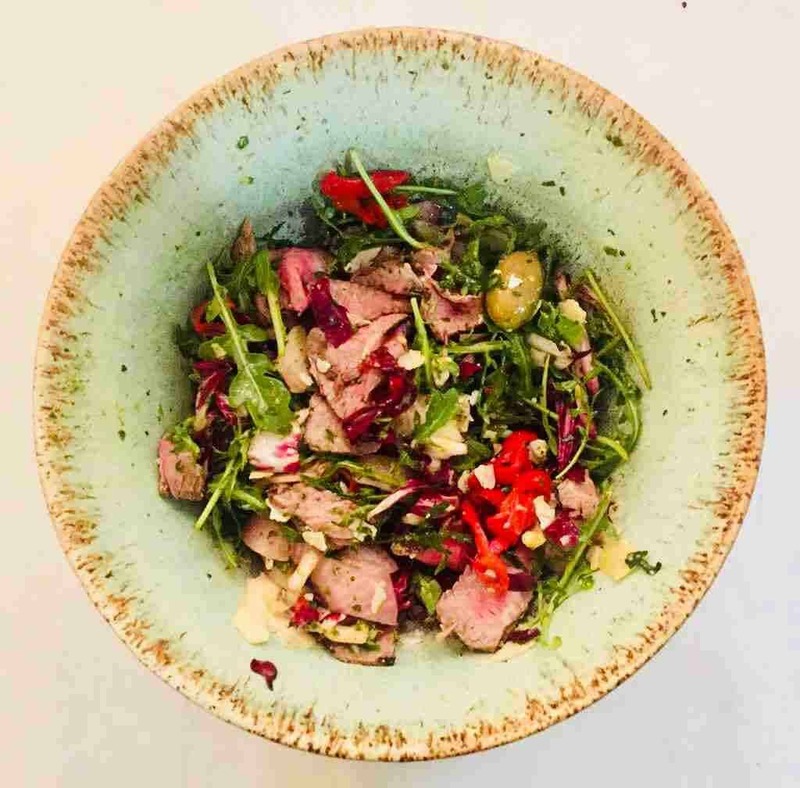 If an ingredient is grass-fed, organic, or free-range, it is clearly noted on the menu. 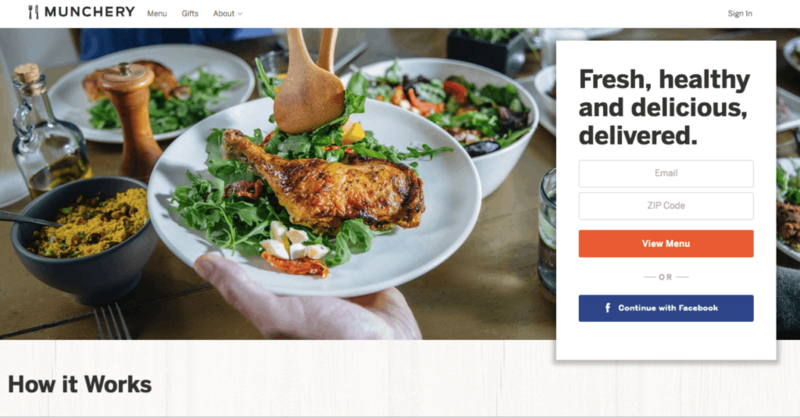 Registering with Munchery is very easy, using their website or app. via your phone. You simply choose one of the two kit type options – prepared meals or cooking kits, select your plan and day of delivery, then select your meals and order. Using either the website or app., you can monitor your account, change meal selections, update your plan, order boxes for delivery in advance, change your personal information and more. If you are on a subscription plan, you can also cancel the account online at any time. From our point of view, Munchery is a perfect meal delivery service. Firstly, and most importantly, the meals are yummy! Secondly, the service is so flexible. You can order on a week-to-week basis or create a subscription, choosing between fully prepared meals or a meal kits that take no longer than 15 minutes to prepare. Regardless of the type of order you choose, the meals are always full of quality fresh ingredients and are created by professional chefs. Munchery is all about making your dinner time as easy, healthy and tasty as can be! The final thing you need to do with Munchery is simply enjoy your meal! Don’t forget to take advantage of their great beginner’s promotion for your first delivery.